butter LONDON, the prestige color cosmetics and nail lacquer brand, is proud to partner once again with Pantone, the global color authority, to introduce the Color of the Year 2018, PANTONE® 18-3838 Ultra Violet. butter LONDON and Pantone have joined forces to co-create an exclusive collection featuring the brand’s cult-favorite formulations in the Pantone Color of the Year 2018 and complementary tonal hues. The limited edition butter LONDON + Pantone collection will pre-launch on butterLONDON.com, Ulta and Ulta.com in December, launch in Nordstrom stores in January 2018, and Kohl’s stores in February 2018. About butter LONDON: Founded in 2005 by a beauty-obsessed British entrepreneur and London’s premier fashion manicurist, butter LONDON catapulted into the runway world bringing a refreshingly hip & haute fashion sense to nails. This trailblazing luxury approach – fueled with a better-for-you ingredient philosophy – quickly made butter LONDON the first world-renowned, high-fashion 3-Free nail lacquer brand. Today, we continue to create innovative, imaginative, good-for-you products for eyes, lip, face, and nail using the same ingenious Crafted with Care™ approach to formulations. We believe playful is beautiful and we encourage you to live a little with lively, luxe products you can trust. We are makeup royalty…and we wear it very well. 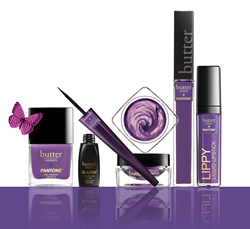 For more information on butter LONDON, visit http://www.butterlondon.com. Pantone offers designers, brands and consumers, products and services through three unique business divisions: Pantone Standards, which includes digital and physical workflow tools and the quintessential Pantone Color Language; the Pantone Color Institute™, which provides trend, brand identity, and color assurance consulting services; and Pantone Lifestyle, the consumer products division that brings color and design together across apparel, home, and accessories. More information is available at http://www.pantone.com.